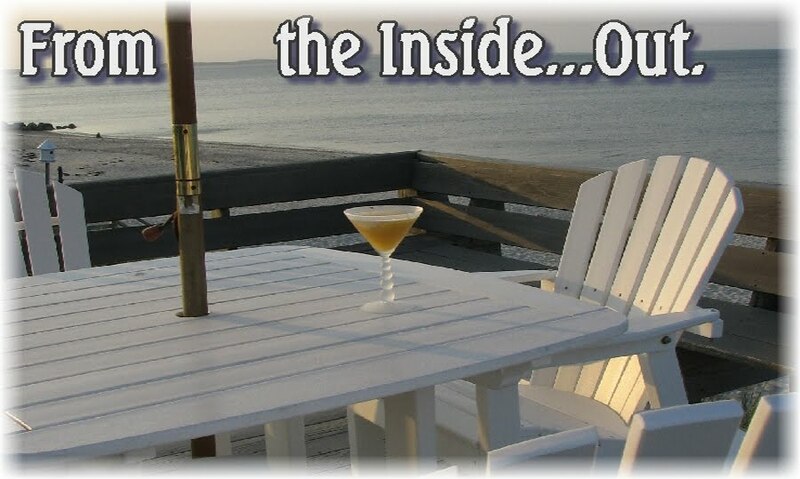 From the Inside...Out: Da Truth? Put on your thinking caps, people! Below is the instruction manual for my shower-head-set-thingie. Did you notice there’s no water coming out of the actual sprayer?? WTF?? The blonde has that “don’t mess with me…I’ve had a really crappy day and what the hell has happened to my hand?? I do believe I have no discernable fingers whatsoever” look...and I believe it's entirely possible that blondie is holding brunette hostage. Or, she's simply trying to hog this photo shoot. I can't be sure. I believe someone was in a pretty big hurry to get out of the office and downstairs for cocktail hour…and since the guys who were supposed to double check his work were already in the elevator, yelling “C’mon! It’s Margarita Night! Buy two, get one free! It’s fine! Leave it! C’MON, MAN…WE’RE GONNA MISS IT! !” And so, he hit “send”…off it went...and the next day everyone was so hung over that no-one noticed his faux pas till it was too late. What? Because before you used Dove, you had…no self-esteem? Excuse me?? I know I’ve mentioned how important “a good hair day” can be…but, yikes…I didn’t mean THIS. C’mon, people! We can do So. Much. Better. Where did they get the idea that we were so stupid?? The shower is my favorite. Really? What the heck are advertisers thinking? I suppose they're trying to go all artsy over our faces? But the girl photo-shopped in half with her feet on cheese is a very close second. Why am I working in insurance? I could do MUCH better advertising than these fools!! As much as I have to agree that the blonde girl's head is extremely large, I kinda want a pair of those leggings, just to take on some new persona, though i don't know what yet. Not sure if it is a good thing or not. but i loves ya! HA! The art of disfigurement... I think that could apply to more than one picture here. The blonde model does look like she has a massive head. 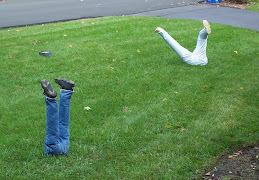 Maybe they're very badly assembled mannequins that they've photoshopped faces onto! Or a collage gone wrong. But if fashion requires me to have a massive head, no arms, no hands and only one functioning leg, I'm totally in! "Where did they get the idea that we were so stupid??" All they had to do was sit down in the middle of the mall...or wal-mart...or any busy public place...and ta-da! The power of observation is a powerful thing. XD Now...true...there are a few exceptions to the rule...like me for example..I'm not that stupid all the time. XD Nor are you...or you wouldn't have posted this. XD Which was freakin' hilarious btw. I needed a good laugh. 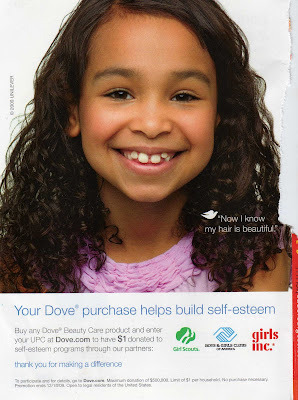 Actually, the dove ad refers to a program that helps girls with their self-esteem that Dove donates a percentage of its profits to. I just don't think the ad clairifys that. All the other ads? Totally agree with you and your writing is hilarious! This was so funny and very true. You have caused me to look twice at the advertisements! These are superb examples of advertising follies. And funny ones. I'll tell you that if you're interested in fashion f-ups and haven't checked out www.gofugyourself.com in a while, it always provides a stream of funnies for me. These are very true! Love the commentary! The shower ad cracked me up. The kid with the mac & cheese... 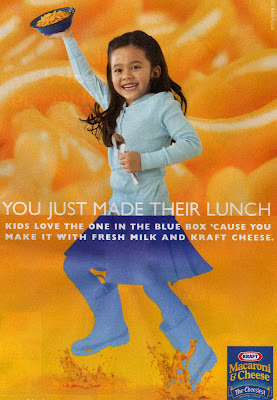 I didn't even realize the poor photoshop quality over the "you just made her lunch.." and I'm thinking she's running to school in her rain boots carrying her mac & cheese that Mom just made for her. Because she has THAT much time in the morning! And the "disfigured", I'm glad you clarified that it was a woman's torso because for the life of me I couldn't figure out which way the picture was supposed to be! I was like, an arm? a wrist? oh.. a stretched belly button! I should have known!! These are funny. Maybe those first two girls need to go sloshing through orange goo. They look so hungry. I haven't washed my hair in two days and I know it's beautiful. I finally did the big announcement post. Check it out when you've got time. Thank you for the laugh! I really needed it. After you read my post, you'll understand why! Are you sure those are shower heads? They might have been something else... haha! Love the disfigurement piece. So sad that advertising is so influential especially to young adolescent and their response is to emulate what they see on the ads. So sad! sigh!! The only people who would buy givenchy or movado are the rich-types, and if they're wannabes they'll do anything to fit in with the in-crowd of the upper class. The mac'n'cheese is for kids, and some of America's kids would BEG their mom's for mac'n'cheese just so they can try the idea of splashing in it's orange sauce. And as for the Dove commercials that's just mean. The advertisers are definitely taking advantage that more than half of American girls and women have very low self-esteem. So they're trying to make their product appealing to those people so that they THINK that now they bought Dove they're more beautiful. *sigh* the crazy world of advertising. I say you get in and change it all around, so that we don't have to endure anymore Kay commercials or commercials of that sort. The two models are just plain scary! They look like you could blow on them and they would fall over and break every bone. I kept looking at the suposed torso, I don't see it, can't even figure out what it is! The two models just look hungry. Who decided that was pretty? Advertisers are such a joke. Did you see that they've given the SunMain Raisen girl an updated look so now she looks like Julia Roberts? And what was wrong with the old Betty Crocker, Aunt Jemima, Morton salt girl, Gerber Baby? Capn Crunch? I just don't know. But good eye in spotting these photos Kathryn! I had been completely passing out at work when I decided "it's time to read a few blogs". I am SO glad I read this! The one with the 2 models had me ON THE FLOOR with TEARS IN MY EYES!!!!! I wanted to cut and paste a million things from there and comment on it, but the ENTIRE thing was great!!!! And that Movado belly button, ewwwwwwwwwwwwwww!!!! I love the Givechy models! It's as if someone put up fun house mirrors and then took the photo shoot. Or maybe cut and pasted the whole thing from different magazines to make these chop shop models. You know, like we used to make collages in grade school. Think about it, we are experiencing hard economical times. A grade school, fun house mirror collage would definitely save money. For the Givechy company. Not for the people buying those dog chewed clothes. And the comment you made about MOVADO: The Art Of Disfigurement is priceless! More fun house trickery? Perhaps...So glad my belly button isn't that elongated. Can you imagine what a piercing would look like in that hole?! LOL! One more thought on the Givenchy Girls-almost like Gilmore Girls ha ha ha-that blond model is probably looking crabby cause she had to eat her own hand and the brunette's arms off cause they wouldn't let her eat before their fun house photo (shop) shoot. Wouldn't YOU be a crabby b@*#! if you had to eat your own hand and someone else's arms, were made to wear ugly dog chewed clothes, and finally (pasted)posed in place in front of fun house mirrors all in the name of high fashion? I bet they're MOVADO disfigured models to boot! Hilarious. 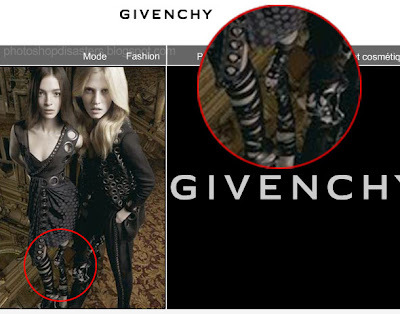 You should that Givenchy one to Photoshop Disasters. Those legs are like something been run over by a lawn mower in an Alien attack. Gruesome. Being in the beauty industry I HOWLED at the Dove one!!! The advertisements that REALLY, REALLY, REALLY kill me are the ones that advertise thickening and lengthening mascara, and the model is SO obviously wearing FALSE EYELASHES! I've never understood how they can get away with advertising a boldface LIE?!?!? * save your money ladies and buy maybellene. It works and it's cheap. That Givenchy ad really has me freaked out. I don't want to look at it but I just have to. Ewwww. Maybe that's what their going for. Ron: I saw your comment and had to comment about it because I value your opinion on beauty. "* save your money ladies and buy maybellene. It works and it's cheap." I am so glad you said this because I have tried every expensive brand of mascara out there and they all smudge!!!! I always go back to the cheep waterproof stuff becasue it works. For some reason every so often I feel like I'm missing the boat and get suckered into going the $$$ way on this... but I end up going back to good old Maybellene. carissajaded: Aw! Right back at-cha with the loooove...a fellow ambien-taker here! And I KNOW....we could so SO MUCH better than these ppl. WHY are we not making the BIG bucks?? Lauren: HA! So, we're hoping that fashion now requires disfigurement?? Can't we just show the product and let it go at that?? Yikes! Gavin: Yes? The "insane" gentleman? You know the answer to where they get off thinkin' we're stupid? Huh...you may have a point there. There are many, many ppl who seem to believe EVERYTHING they *see*. Haven't ppl heard of Photoshop?? Kristen: Thanks! Yeah, I *get* the Dove helping girls w/self-esteem, but it reads that her self-esteem is somehow only improved after she uses DOVE. Doesn't it seem that way to you?? dailyseeking: Well, good! 'Cause many of these ads are just getting WORSE. It's like they're not even trying any more. Gropius: I always enjoy seeing other people mess up...it balances out the stupid mistakes I make in my own life! I'll check 'em out! serendipitous: Weird stuff, right? I'm guessing these advertisers are wishing I hadn't paid so much attention about now. BUT, it makes me crazy! Erin@TheLocalsLoveIt: Ya know...you're right! They DO look hungry! THAT'S what that look is!! Tinkerschnitzel: You're welcome! I'm on my way, sweetie! WannabeVirginiaW: Yikes! If they try to emulate this messed-up crap, what's to become of them?? It's not even GOOD Photoshopping! Scary. book*addict: HA! So, the upper crust won't mind that their models are severely deformed? Maybe it's just another cosmetic surgery gone wrong for them! And doesn't that Mac & Cheese ad just bite? Talk about promoting chemicals! Ew, ew and ew! Heather: I KNOW! The guy in charge of Photoshopping this wasn't even trying...he obviously could have cared less. Jen: I agree! Since when is hunger (combined with a Photoshop deformity)flattering? Ya got me. Loredana: HA! I'm sooo glad I was able to make you smile! I was pretty blown away by these photos myself! How bizarre can advertising be?? Just look at these and decide for yourself, right?? Wendy Blum: HA! "Chop-Shop Models"!! HA! You're right....a belly-button piercing would be g-r-o-s-s! But think about how perky your breasts would be...right under your chin like that!! OMG....I just read the 2nd half of your comment....you're ON FIRE, girl!! You're correct, of course! SHE ATE HER OWN HAND AND THE OTHER MODEL'S ARMS!!! OMG!!! 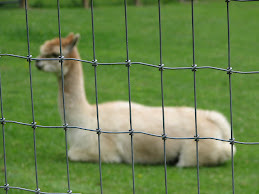 Apryl: "Those legs are like something been run over by a lawn mower in an alien attack." HA! Great description! I LOVE it! RON! Oh, I never understood the whole mascara ad, either! Even on tv...it's simply not possible that some glop in a tube can quadruple the number of eyelashes you have!! Isabella: Well, I think we should be able to expect better for Givenchy. I mean, seriously. Yeah...it's like a car wreck...you can't look away! Gingerella: Oh, how I HATE when that happens! I can totally feel your pain, sweetie. Thanks for taking the time to comment AT ALL! Fierce: Ooooh...so, a whole Twilight Zone-theme? I'll buy that. 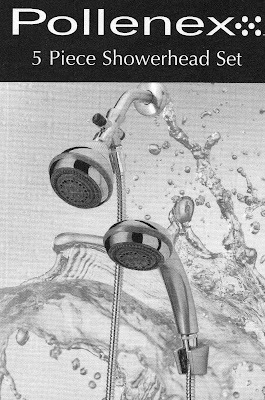 I just cudn't believe there was NO WATER coming out of the shower heads....and there's 2 of 'em! Really, Kathryn, I don't understand your perplexion. The brunette model has obviously been photoshopped onto the legs of an Old Kingdom mummy. I mean, it's right there in front of you: the dessecated legs, the tattered funerary wrappings... Margarita Man is probably a closet historian. Let's not judge. It was an honest mistake, I'm sure.